Dr. Craig Oswald grew up in the northwest suburb of Palatine. He went to Western Illinois University where he received his Bachelor’s degree in 2003. Dr. Oswald furthered his education to include an MBA from Roosevelt University in 2006. Dr. Oswald received his Doctor of Chiropractic degree from National University of Health Sciences in Lombard, Illinois in 2012. Prior to becoming a chiropractor, Dr. Oswald worked mostly in marketing. It was in this nine-to-five lifestyle that he felt a void, expending time and energy in a profession that failed to provide a meaningful impression on the surrounding community. This led him to look for a new opportunity. Dr. Oswald chose a career in chiropractic because of his desire to make a difference in the lives of others that paired well with the prescription-free philosophy that only chiropractic can provide. He has experience in treating a variety of conditions and injuries and has worked with many communities in and around Chicago. He has treated a wide variety of patients, from newborns to those who are more “life-experienced”; those who have the minor nagging aches to the post-surgical; student athletes to the weekend warriors. Dr. Oswald has a deep understanding of a variety of techniques that have helped patients return to a state of wellness and most importantly, happiness. “Seeing mothers and children thrive after their adjustments is amazing. I think everybody has the potential to have a better, healthier life. I’m passionate about pediatrics because you can make such a big difference in children’s lives by helping them be healthier.” Dr. Craig Oswald’s patients range in age from newborn babies to a 103-year-old! 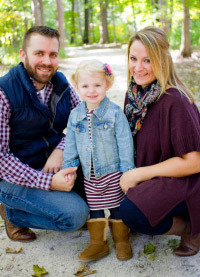 Dr. Oswald currently lives in Lake in the Hills with his wife Kimberly and his 3 year-old daughter Abigail, both of whom get adjustments regularly. In his free time he enjoys spending time with family and friends, being outdoors, and playing and listening to a variety of music. Find out what we can do for your family. Contact our office today!